Property 4: Papamoa Beach_Break, modern, clean and inviting. 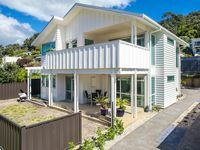 Property 31: Stylish apartment between Waihi Beach and Katikati. Property 42: Sparkling new modern flat. Property 43: Twin Towers 7th floor 2bedrooms 2bathroom, spacious. Property 47: Cosy, private and central location!